As people take control of their finances and their savings start to grow, they often ask us how much they should keep in their emergency fund. There’s no hard and fast rule on savings—it really depends on how much you earn, how much you spend, your priorities, your other financial commitments, and your general view on life. But as a minimum, no matter your salary, you should be saving at least $100 per month. This is useful for emergencies and to fall back on if a bill arrives that’s higher than expected. It also provides a buffer that keeps your budget intact. That’s why every budget we design at MyBudget includes a savings plan. A person who has no or very little savings is walking a thin line. What happens if they lose their job or their car needs expensive repairs or they can’t work next week because their kid is sick? Most people in this position end up using a credit card or fast cash loans to make ends meet. This is how the debt spiral starts for many people. In general, the more savings the better. Once you’ve reached your emergency fund savings goal you can then decide what to do with your extra savings—top up your super, invest in shares, open a term deposit, pay down your mortgage faster, take a well-deserved holiday etc. How you invest your savings will be influenced by your priorities and by, what financial advisors call, your risk profile. 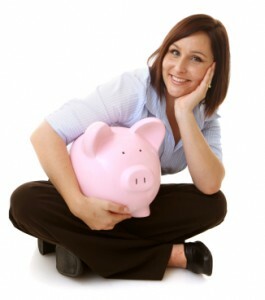 A good goal is to have at least one month’s salary in savings. An even better position is to have six months. To keep your emergency fund safe and out of reach ("break glass in case of emergency!") you might think about keeping the money in a term deposit. The banks are currently looking for cash which is why we’re seeing some decent term deposit rates. Shop around to find a term that suits you and your needs. Make sure you understand the penalties or conditions should you have to withdraw funds before the maturity date.